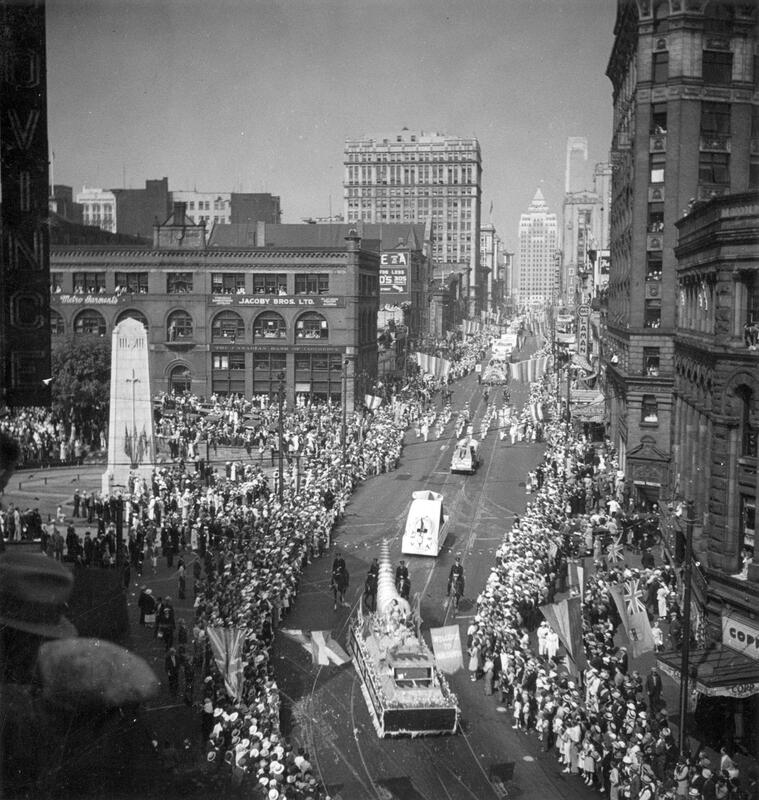 The City’s 50th birthday was in 1936. 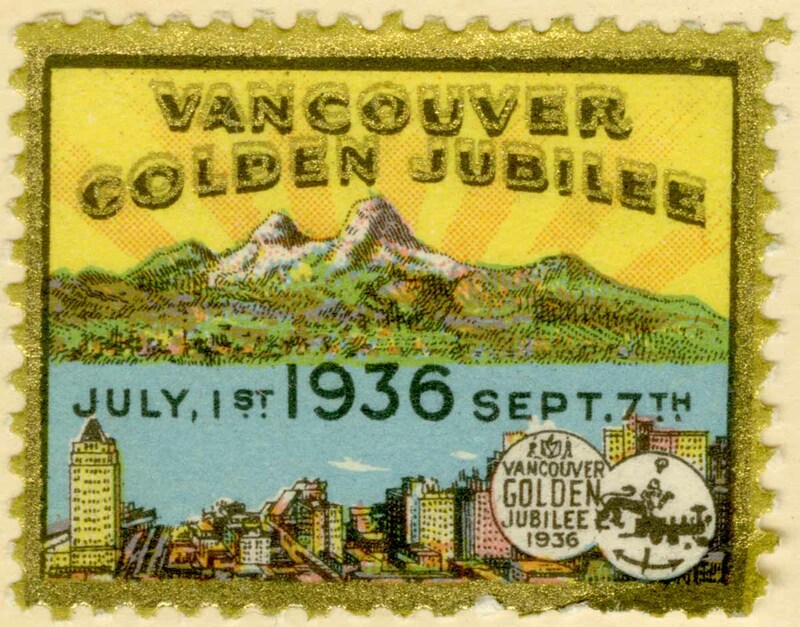 Citizens of Vancouver, just like those now awaiting the 125th anniversary, were eagerly anticipating the City’s first major anniversary celebration: the Golden Jubilee. Vancouver in 1936 was much different from 2011, and not just in terms of its landscape. Rather than gaining momentum from a large internationally watched event the year before, in 1936 the City was still suffering from the impact of the Great Depression. Although the population of Vancouver was over 250,000, making it the third largest city in Canada, high unemployment, relief camps, and episodes of social unrest were emblematic of the decade. In spite of the unfavorable conditions and the criticism of spending too much, Mayor Gerry McGeer enthusiastically promoted the Golden Jubilee . Throughout the year there were over 800 hours of celebrations including parades, carnivals, dances, sporting events and musical performances. Today, we can still see remnants of the 1936 celebrations in the Lost Lagoon Fountain in Stanley Park, the Captain Vancouver statue at City Hall, and City Hall itself (City Hall was opened on December 4, 1936, which marked the close of the year’s celebrations). 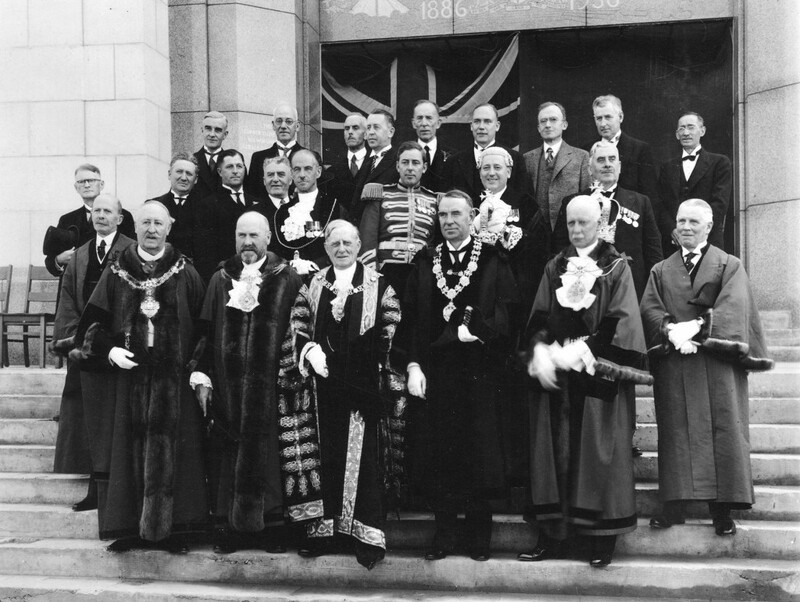 In order to organize such a large event, a Golden Jubilee Society was formed in 1935 with board members from the City and various civic organizations. The records of the Society are kept in the in the City of Vancouver Archives as the Vancouver Golden Jubilee Society fonds. The fonds consists of minutes; correspondence; newspaper clippings; an album of photographs compiled by Major Matthews, the first City Archivist; a bound volume of minutes for the City Council Meeting of August 20, 1936; a visitors’ register; records of the Women’s Division of the Jubilee Committee; programs and menus; and other material. The Vancouver Golden Jubilee Society fonds is a relatively small body of records, with no more than 10 boxes of textual materials and about 300 photographs. The fonds documents how the City collaborated with various communities to deliver a successful celebration, which aimed at bringing hope, pride, spectacle, and enjoyment to Vancouver’s citizens struggling in harsh economic times. The minutes and correspondence of the Society tell us that the 800 hours of Golden Jubilee events occurred over seven weeks and required 86 preparatory meetings. 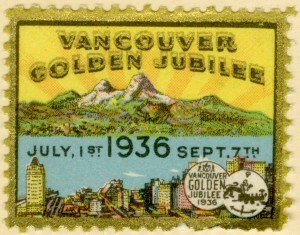 Even though the Golden Jubilee was Vancouver’s very first anniversary celebration, it took place under the dark shadow of the Great Depression. The celebration is barely or only very generally described in most of the history books on Vancouver. In fact, the Golden Jubilee seems to have been was a very successful event. The society strove to bring joy and pleasure to the citizens but also to give courage, hope and comfort to people facing difficult times. Thanks to the Vancouver Golden Jubilee Society fonds, this wonderful piece of Vancouver’s history is preserved and this sweet moment in time can be recalled. City of Vancouver Archives, Vancouver Golden Jubilee Society fonds, Add. MSS. 177, Loc. 513-B-8 file 6, Correspondence, 1936. City of Vancouver Archives, Vancouver Golden Jubilee Society fonds, Add. MSS. 177, Loc. 513-B-8 file 5, Correspondence, 1936. This entry was posted in Holdings and tagged fonds, Vancouver Golden Jubilee Society. Bookmark the permalink. No still havn’t gotten any information on these coins outside the fact there is more out there! I have also found one of the 1886 Vancouver Jubilee key to the city signed by the mayor coin and would love to know its value. I am looking for information on a painting that was presented at this time, by the artist Walter Dexter. It is of the King’s Lynn Customs House. Does anyone know if it is in storage somewhere or on display? My cousin in England is writing a biography of the artist and has asked me to help her. I have a poster of the 1936 Vancouver Golden Jubilee. Can you tell me anything about it? 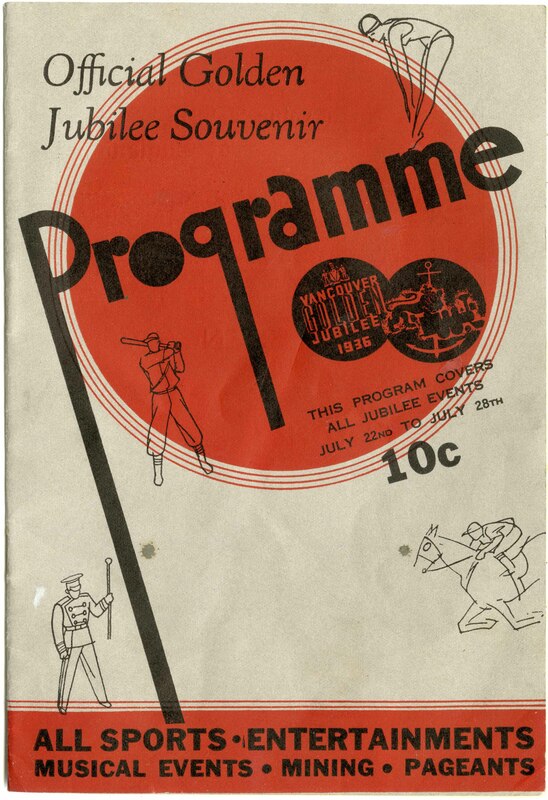 You’d probably have to look through the records in the Jubilee Society fonds to see if there’s any information about its design, use, etc. My grandfather. R.Harold Williams, designed and erected the Jubilee fountain. He was the Chief electrical Engineer at Hume & Rumble Ltd. Just going through his personal papers, letters and pictures. So proud of him. Such a beautifull addition to Stanley Park. I have a cup, saucer and lunch plate of the jubilee, 1936. Are they rare?